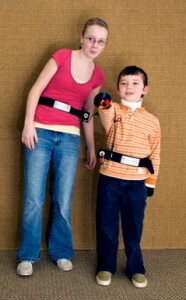 The Connector Rx consists of two belts; one for the adult’s waist, one for the child’s waist and a connecting cord, which is designed to come apart when pulled. The Connector Rx is a system that enhances the ability of the users to send and receive social signals. reasons are not entirely clear, preliminary research has shownthat the simple act of physically connecting a child to their caregiver with the Connector Rx significantly improves the child’s ability to resonate with the caregiver’s experiences, and integrate this information to respond appropriately to environmental and social signals. The result is an improvement in the child’s relationship skills and in their ability to focus and learn from their social environment.